On my 30ths birthday my neighbours gave me a bottle of old caribbean rum. Of course I knew rum before, ordinary rum for grog or cooking and white rum for cocktails, but not fine old rum aged in oak barrels. I was surprised how good this old rum tasted. Since that day I love rum. I visited many rum shops in Barbados and other Caribbean countries and enjoyed a drink at the bar. 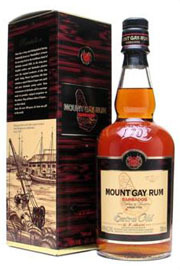 My favoured brands are Mount Gay Extra Old and Demararas El Dorado Rum. I had the pleasure to visit several rum factories around the world, including Mont Gay in Barbados, Bacardi in Puerto Rico and Budaberg Rum in Australia. Only the Fabrica de Ron in Santiago de Cuba did not let me in. I am sure there are many good rums that I still don't know. I think, old Rum is similar to Brandy but has much more character. The origin of the word rum is generally unclear, but probably comes from the word Rumbullion. The birthplace of Rumbullion is considered to Barbados, around 350 years ago. Rumbullion is a Devonshire word meaning "a great tumult", and may have been adopted from some of the Devonshire settlers in Barbados. Plantation slaves realized that molasses, left over from sugar refinement, could be turned into alcohol. The first rum was a terrible tasting liquor. The Caribbean is the epicenter of world Rum production. Virtually every major island group produces its own distinct Rum style. Also several Central American and South American countries, Australia, Fiji, Mexico, the Philippines, India, Reunion Island, and Mauritius are rum producers. Most companies produce rum from molasses, a few use pure sugarcane juice. Molasses is a by-product of the processing of sugar cane into sugar. The word molasses comes from the Portuguese word melaço, which ultimately comes from mel, the Latin word for "honey". Molasses retains up to 5 % sugar. There are four major processes involved in making rum; fermentation, distillation, aging and blending. The molasses is mixed with a special yeast and then placed into vats for the fermentation stage. The yeast initiates the process of transforming the sugars into alcohol. The result is cane wine with 7 % of alcohol that will be sent for distillation. Distilling separates the alcohol from the fermented mixture and concentrates it to make the actual rum. This rum is aged in oak barrels and ultimately blended to produce the spirit we know as rum. Today, almost all rum is aged in used oak barrels that once held whiskey or bourbon. There are different sorts of rum, light rums, spiced rums, flavored rums, overproof rums, white rums, dark rums, and others. Here we only want to talk about the carefully produced and aged premium rums. They have more character and flavor than their "mixing" counterparts, and are generally consumed straight. Don't drink them on ice and please, never spoil them with coke! 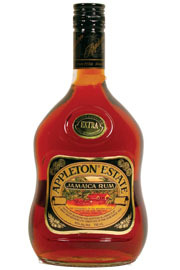 Appleton Estate is the oldest and most famous of all of Jamaica's rum producers. It is nestled in the fertile Nassau Valley on either side of the Black River in the Southwest of Jamaica. The origins of Appleton Estate date back to 1655 when the English captured Jamaica from the Spaniards. The existence of Demerara Distillers can be traced back to the year 1670 when about 300 small rum producesrs in Guyana formed a co-operative. With changes and consolidation over time these were gradually merged into one distillery operation in Diamond, outside Georgetown. 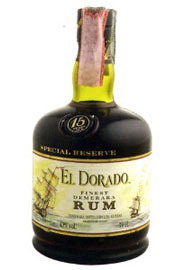 In 1992 they launchedtheir El Dorado range of rums, which won many awards. 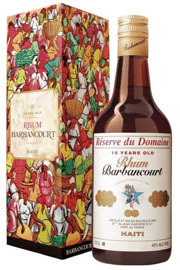 Dupré Barbancourt, a Frenchman from the cognac-producing region of Charente emigrated to Haiti, and founded his company in the 1860s, producing rum directly from sugar cane juice. The Barbancourt family grows the sugar cane for their rum in their own fields. The rum is double distilled, using a process similar to that used to produce cognac. Cruzan Rum, Saint Croix, U.S.V.I. Their Cruzan distillery was founded in 1760 and has gone through several owners in the last century. Since there is no longer a sugar mill on St. Croix, there is no local supply of molasses. The raw material arrives by ship from South and Central America. Further remarkable rums are Admiral Rodney Rum from Saint Lucia, J.M Rhum from Martinique, and others.